Conditions of Use and Sale. 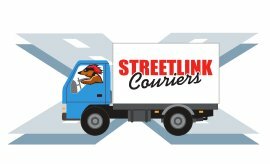 Streetlink Couriers Ireland Limited provides access to our website to sell our service to you subject to the conditions set out on this page. Please read these conditions carefully before using the Streetlink Couriers Ireland Limited website. By using the Streetlink Couriers Ireland Limited website, you signify your agreement to be bound by these conditions. Conditions Relating to Your Use of Streetlink Couriers Ireland Limited. Please ensure that the details you provide us with are correct and complete and inform us immediately of any changes to the information that you provided when registering. You can access and update much of the information you provided us with in the account area of the website. Streetlink Couriers Ireland Limited reserves the right to refuse access to the website, terminate accounts, remove or edit content, or cancel jobs at our discretion. If we cancel a job, it will be without charge to you. Streetlink Couriers Ireland Limited grants you a limited licence to access and make personal use of this website, but not to download (other than page caching) or modify it, or any portion of it, except with express written consent of Streetlink Couriers Ireland Limited. This licence does not include any resale or commercial use of this website or its contents; any collection and use of any product listings, descriptions, or prices; any derivative use of this website or its contents; any downloading or copying of account information for the benefit of another merchant; or any use of data mining, robots, or similar data gathering and extraction tools. 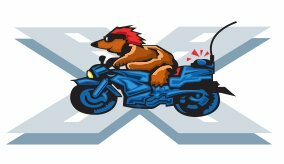 You may not frame or use framing techniques to enclose any trademark, logo,or other proprietary information (including images, text, page layout, or form) of Streetlink Couriers Ireland Limited without express written consent. You may not use any meta tags or any other utilising Streetlink Couriers Ireland Limited names or trademarks without the express written consent of Streetlink Couriers Ireland Limited. Any unauthorised use terminates the permission or license granted by Streetlink Couriers Ireland Limited. All content included on the website, such as text, graphics, logos, buttons, icons, images, audio clips, digital downloads, data compilations, and software, is the property of Streetlink Couriers Ireland Limited, its affiliates or its content suppliers and is protected by Irish and international copyright and database right laws. The compilation of all content on this website is the exclusive property of Streetlink Couriers Ireland Limited and is protected by Irish and international copyright and database right laws. All software used on this website is the property of Streetlink Couriers Ireland Limited, our affiliates or our software suppliers and is protected by Irish and international copyright laws. 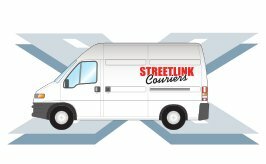 You may not systematically extract and/or re-utilise parts of the contents of the website without Streetlink Couriers Ireland Limited express written consent. In particular, you may not utilise any data mining, robots, or similar data gathering and extraction tools to extract (whether once or many times) for re-utilisation of any substantial parts of this website, without Streetlink Couriers Ireland Limited express written consent. You also may not create and/or publish your own database that features (eg our prices and product listings) parts of this website without Streetlink Couriers Ireland Limited express written consent. One or more patents apply to the website and to the features and services accessible via the website. These patents are registered in the US, Ireland and EU, please contact Streetlink Couriers Ireland Limited, if you would like more information. Conditions Relating to the Sale of Services. This section deals with conditions relating to the sale of services by Streetlink Couriers Ireland Limited to you. When you place an order for a job on Streetlink Couriers Ireland Limited, we will send you an e-mail confirming receipt of your job and containing the details of your order. Your job represents an offer to us to purchase a service which is accepted by us when we send e-mail confirmation to you that we’ve despatched that product to you (the Despatch Confirmation E-mail). That acceptance will be complete at the time we send the Despatch Confirmation E-mail to you. Any jobs on the same order which we have not confirmed in a Despatch Confirmation E-mail to have been despatched do not form part of that contract. Prices calculated and displayed on the Get Quote portion of this website are not inclusive of any waiting time, road tolls, or other additional charges incurred during the execution of your job due of changes initiated by you after despatching or circumstances not anticipated. Charges added to a quote due to these service add-ons will be calculated and charged to your credit card or account after the completion of the job. Because the quote for a job may be an amount less than actually charged, Streetlink Couriers Ireland Limited retains the right to authorise with your credit card company an amount up to 20% higher than the originally quoted amount during the initial credit card authorisation process. Please note that despatch estimates are just that. They are not guaranteed despatch times and should not be relied upon as such. Packages must not contain any of the prohibited articles listed ) articles of unusual value, articles of pride in possession (such as works of art, antiques, precious stones, stamps, unique items, gold or silver), money or negotiable instruments (such as cheques, bills of exchange, bonds, savings books, pre-paid credit cards, share certificates or other securities), firearms and dangerous goods. Packages must not contain goods which might endanger human or animal life or any means of transportation, or which might otherwise taint or damage other goods being transported by Streetlink Couriers Ireland Limited, or the carriage, export or import of which is prohibited by applicable law. Perishable and temperature sensitive goods will be transported provided that the customer accepts that this is at their own risk. Streetlink Couriers Ireland Limited does not provide special handling for such packages. Fragile items The Insurance Terms and Conditions of our Delivery state that glass, china, ceramics, wax products and fragile items are not covered by Transit Liability Insurance for damage or breakage caused during Transit. Therefore please note,these items are sent at customers own risk and must be carefully packaged. Damage or breakages are not insured for these types of items. Conditions Relating to Both Your Use of Streetlink Couriers Ireland Limited and Sales to You. When you visit Streetlink Couriers Ireland Limited or send e-mails to us, you are communicating with us electronically. We communicate with you by e-mail, phone or by posting notices on the website. For contractual purposes, you consent to receive communications from us electronically and you agree that all agreements, notices, disclosures and other communications that we provide to you electronically satisfy any legal requirement that such communications be in writing. This condition does not affect your statutory rights. Streetlink Couriers Ireland Limited will not be responsible for any business loss (including loss of profits, revenue, contracts, anticipated savings, data, goodwill or wasted expenditure) or any other indirect or consequential loss that is not reasonably foreseeable to both you and us when you commenced using the website or when a contract for the sale of goods by us to you was formed. We reserve the right to make changes to our website, policies, and these Conditions of Use Sale at any time. You will be subject to the policies and Conditions of Conditions of Use Sale in force at the time that you use the website or that you order goods from us, unless any change to those policies or these conditions is required to be made by law or government authority (in which case it will apply to orders previously placed by you). If any of these conditions is deemed invalid, void, or for any reason unenforceable, that condition will be deemed severable and will not affect the validity and enforceability of any remaining condition. These conditions are governed by and construed in accordance with the laws of The Republic of Ireland. You agree, as we do, to submit to the non-exclusive jurisdiction of the Irish courts. Electrical Goods, TVs, Fridges etc.